How am I this lucky? What an awesome freakin’ job I have! It is SO RANDOM that I am a Marriage Celebrant! I got engaged in 2010, I was 23, and like most brides I was dizzy with excitement. There were so many things to consider and plan, and being a little OCD I was loving having to organise what would be one of the most significant days of my life. All the dress shopping, venue searching, bridesmaid picking, and theme selecting was so exciting, and another thing I really invested time into thinking about was my ceremony. I come from a divorced family so I wasn’t sure how I felt about the whole conventional marriage thing, so I decided I would read the Marriage act to see what I was signing up for. I am not sure what I thought it would say, but once I had read it I was surprised. It is a very in-depth legal document, which protects the interests of brides, grooms, celebrants, officials and members of the church. But it doesn’t talk about Marriage, the ceremony, or the significance of those things. My research continued, I learnt all about ceremony, and the union of two people through ritual through the ages. This is where I discovered I have a passion for ceremonies. In 2012, shortly after my wedding, I completed my Certificate IV in Celebrancy and began the process to be registered. In February 2013 I officiated my first ceremony, and it was amazing. I had found something, something I was meant to be doing. I believe in Love, I believe in Marriage, and I believe in having an epic celebration about the two. 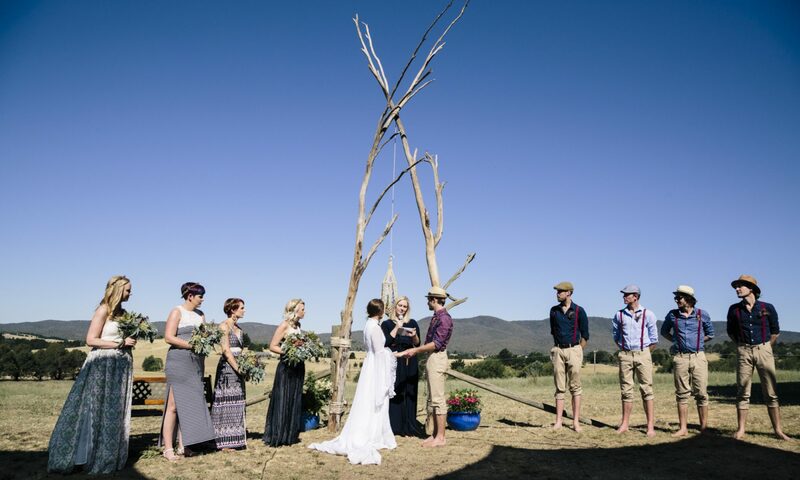 Over the years I have officiated weddings for the most amazing couples, who have each played such a significant role in my experience and development as a celebrant. I have also come to discover that I am not really a conventional Celebrant. Unlike the Marriage Act, I am neither old, nor serious, unless I have to be. Booking me as your celebrant means that I will want to know you, both as a couple, and as individuals. I want to officiate a ceremony that no one is expecting, but is 100% completely and honestly who you are. I want to laugh with you, have fun, hold back a tear as you walk down the aisle, and beam at you with my ridiculous grin as you greet your families as Husbands and Wives for the very first time. I’m based out of Canberra and travel to the Snowy Mountains, Southern Highlands and NSW South coast often. So give me a call or shoot me an email, and lets get to work!